Title: On A Clear Day You Can See...The Leviathan! Synopsis: Tales To Astonish #3 reprints Sub-Mariner #3 (July 1968). Duped into battling each other instead of their common foe, Namor and Triton watch helplessly in captivity as the Plant Man sends his mind-staggering creations to wreak havoc in London. We learn that Plant Man grew up in the slums of London among fools who thought he was insane and he intends to have his revenge by unleashing a Leviathan on the city. He tries to convince Namor to be his emissary to deliver a message to the English government, but the prince refuses. 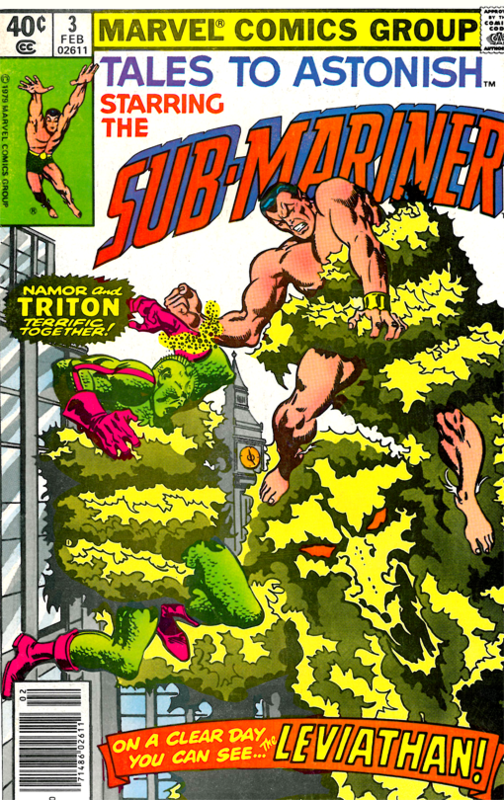 Plant Man teleports Namor and Triton elsewhere on his ship, binding the two men together wrist-to-wrist and subjecting them to a series of trials. Namor and Triton overcome the challenges and break free of their prison, knocking the Plant Man unconscious before escaping the ship to save London from the Leviathan unleashed by the insane villain. An interlude takes us back to the Atlantean Flagship where Lady Dorma's mourning for her prince is interrupted by the news that Namor is alive. She orders the Flagship to London immediately, but is convinced by Lord Vashti that it would be dangerous for her people to approach the surface dwellers. Back in London, Namor and Triton determine that fire is their best weapon against Plant Man's Leviathan and deliver a deathblow to the monster with the contents of a vat from a nearby refinery. The Plant Man makes his escape as the two heroes are finally freed of the energy field that bound them wrist-to-wrist, parting as friends tied together by "nothing but the invisible bonds of shared peril." Next issue: Attuma Attacks The Atlanteans! "Nuff Said! Just dug this out of a long box in the closet and gave it a long-overdue re-read. Great write-up!